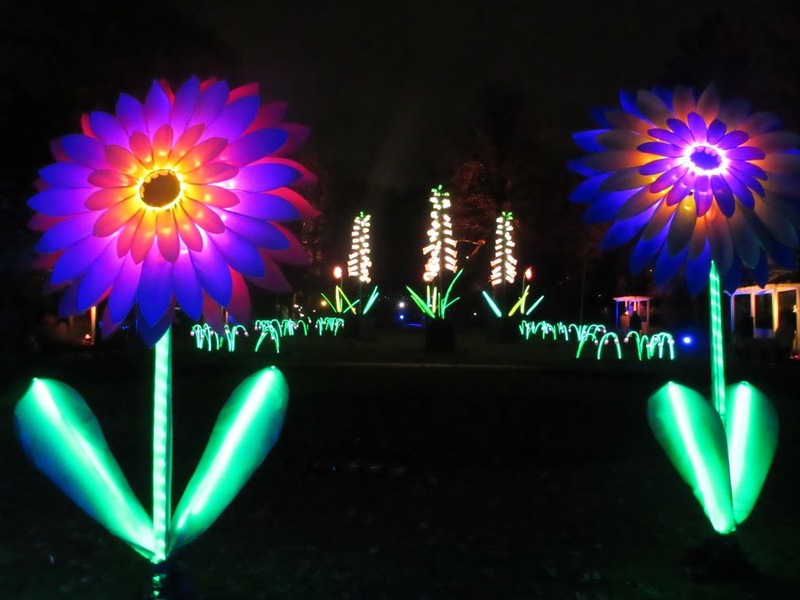 Gateshead Enchanted Parks opens its gates again for six nights this December, to showcase its annual magical mystery event. 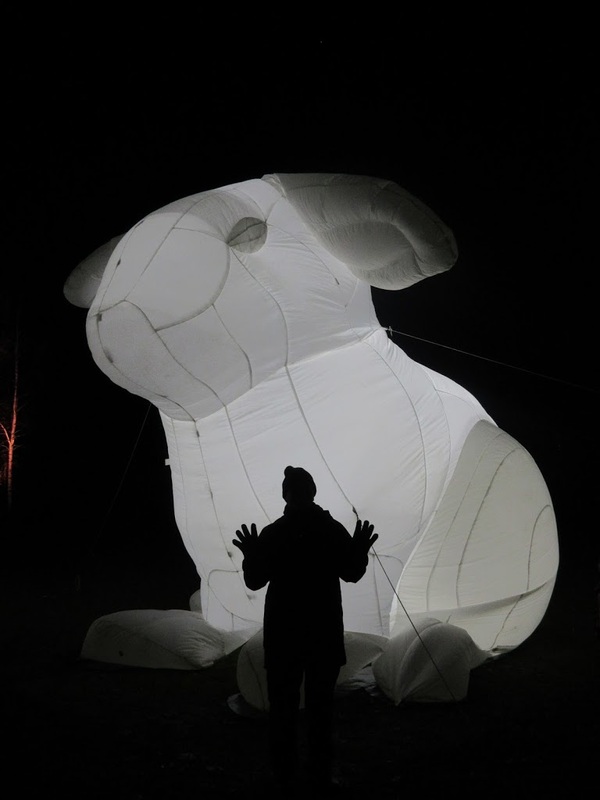 Commissioned artists and their wonderful imaginations transform Gateshead’s beautiful Victorian Saltwell Park into a world where anything can happen. 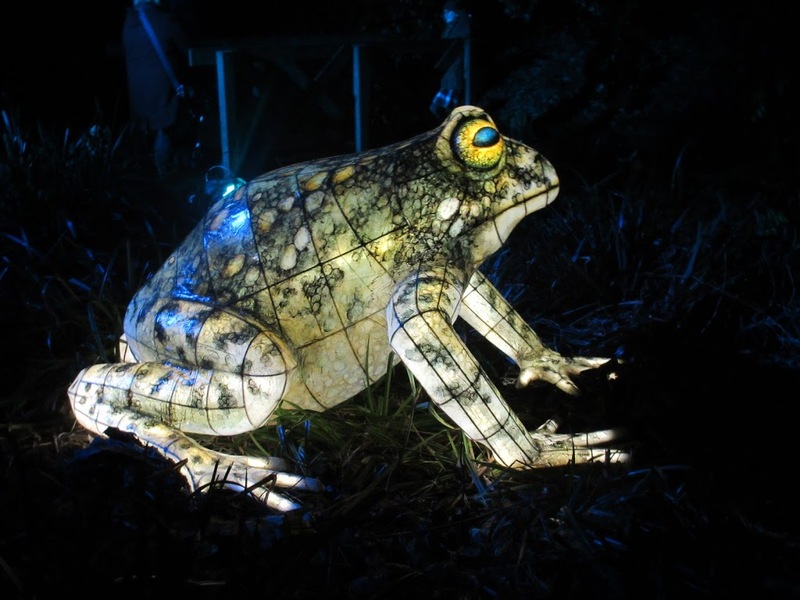 This year the theme is the Inventor’s Ball and Ursula Wailes, heiress to the Saltwell Tower’s estate, fills the park with incredible inventions, rare plants and illuminated night creatures. It is said that a mysterious invitation had been dispatched inviting the next ‘generation of optimists’ to the Inventor’s Ball. 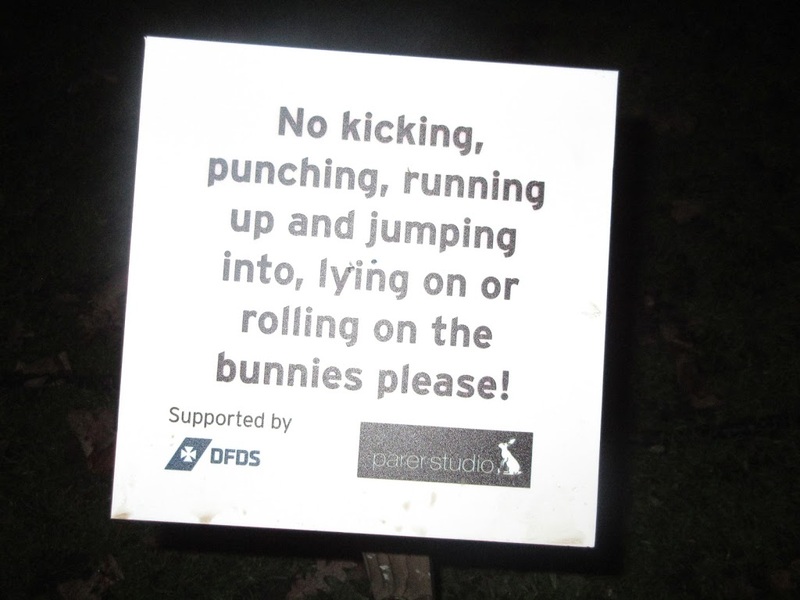 I’ve been to many of the Enchanted Parks events and while some years seem to be better than others – who can forget the giant Newton’s Cradle or the flame and Frankincense fire garden? – there is always something to capture the imagination at this special local venue. 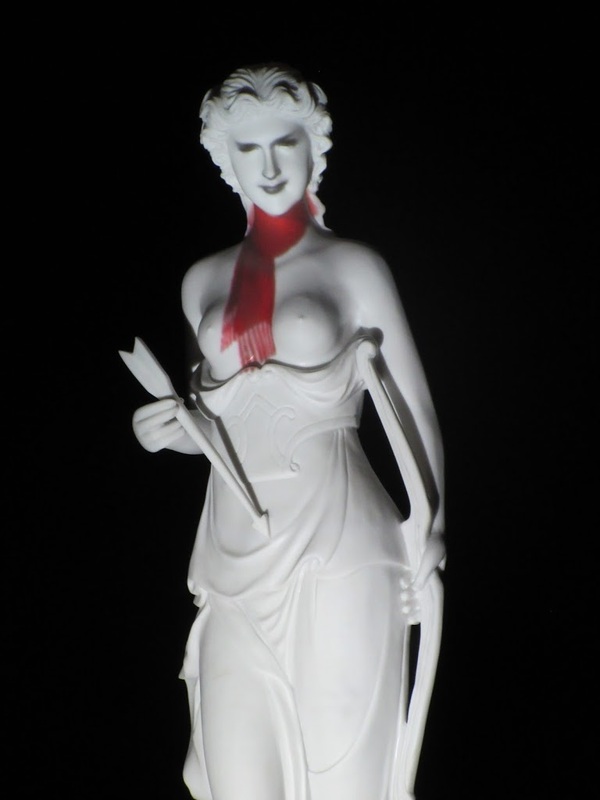 I liked the crazy statue of Diana which has the face of Ursula Wailes projected onto it. She had a few things to say to us, that’s for sure, and she seemed to be particularly interested in how her mind could be separated from her body and then go off wandering through the park in a curious and enquiring manner. 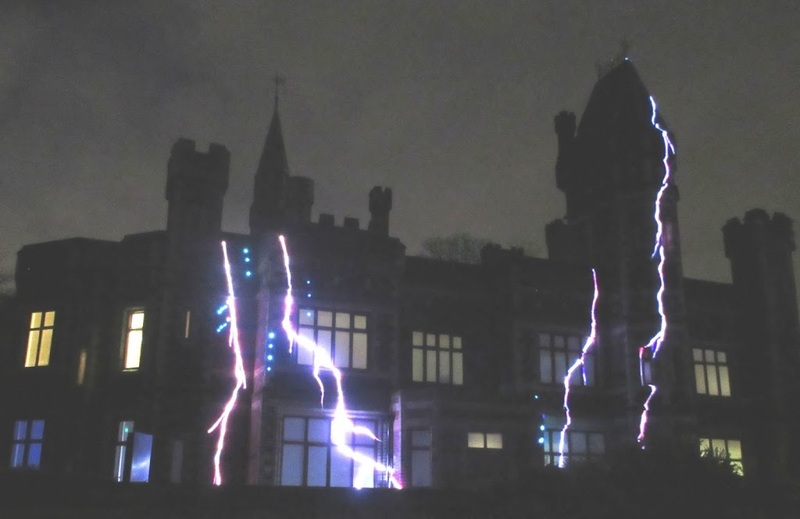 Saltwell Towers itself, the family home of the Wailes, who really did live there by the way in Victorian times, is lit up with impressive forked lightening and electrical arcs crackling around the building and run up and down its facade. 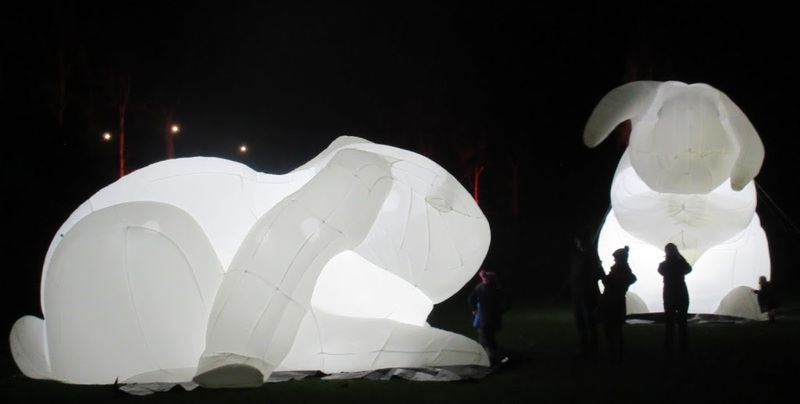 Giant inflatable illuminated white bunnies sway gently on the field. Children are warned to treat them well, but they are as overwhelmed with tactile attention as any of their smaller furry relatives. 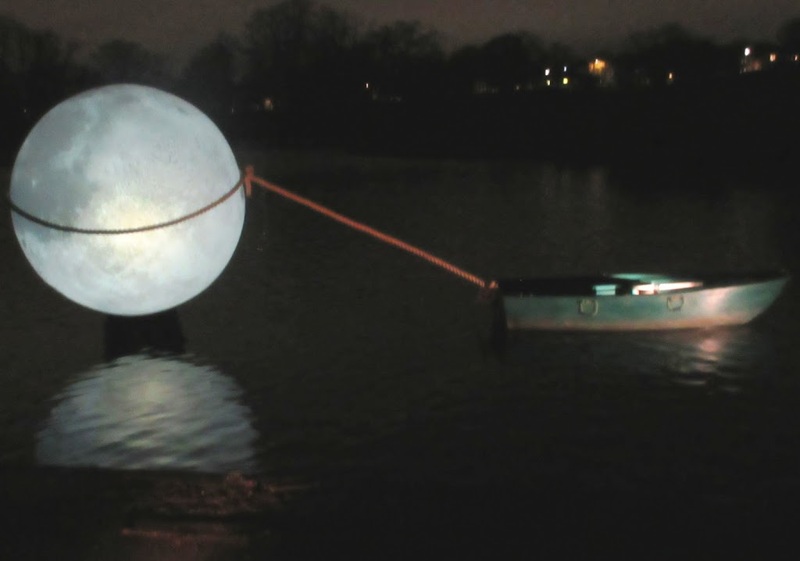 I wonder if they’ll last the week..
We walked through a light field of colour changing stems and stumbled across a small rowing boat on the Saltwell Park Lake which seemed to have managed to lasso the moon and bring it down out of the sky. ‘Look’ said a mum to her small child ‘It’s has captured the moon!.’ ‘Why?’ replied the small child ‘Well why not?’ she responded. That’s the spirit! One highlight of the park for me was the Apothecarist’s garden with its huge luminous sunflowers, snowdrops, lupins and tiger orchids. We next came across the Pinery of Percival P, all about a type of magical pineapple grown at Saltwell Park which thrives on being played music and in particular loves to be sung to. A large pineapple was displayed in its own garden bower being seranaded by invisible singers. The song of the pineapple was quite charming actually. 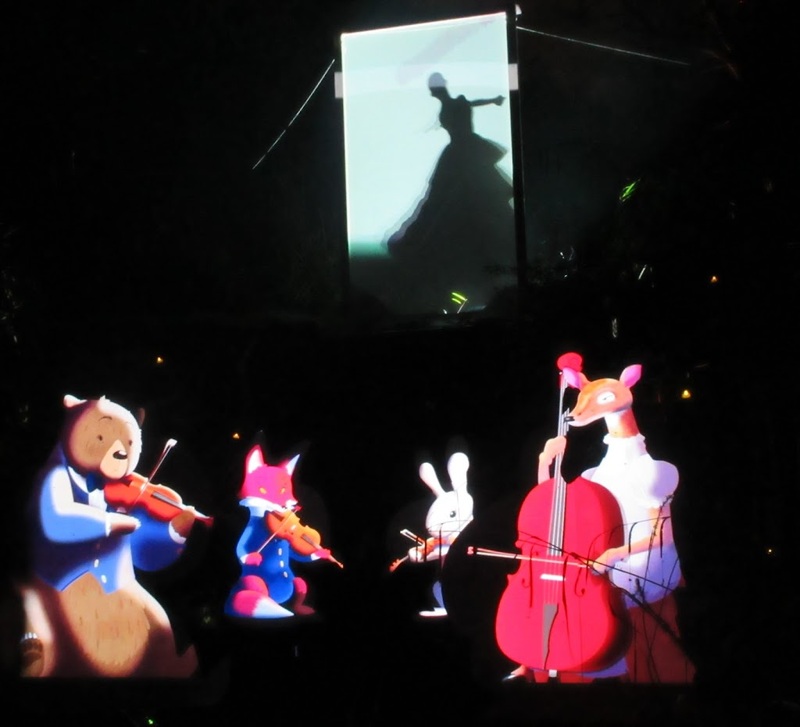 playing by a waterfall beneath the twirling silhouette of a figure dancing at the ball. 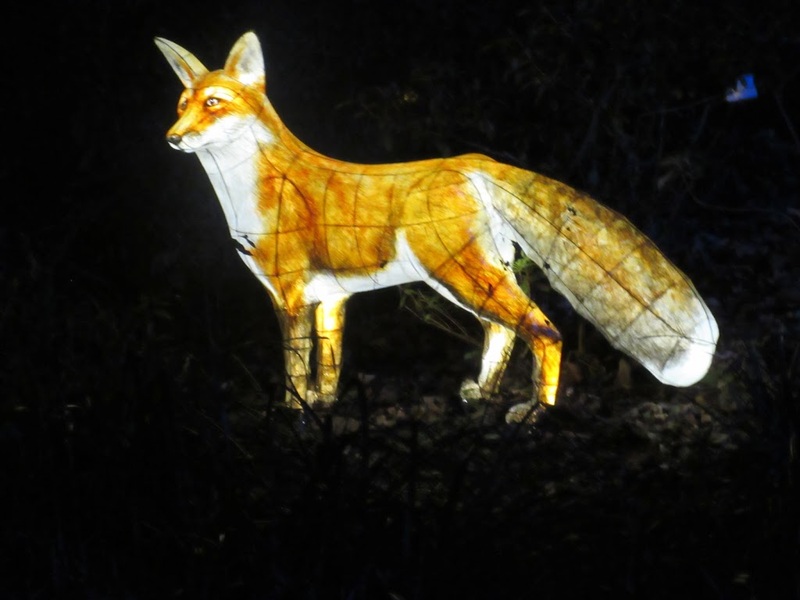 Human guides lit up by strings of lights herald the way around the park, and if you feel the need for refreshment you can always pop into the Saltwell Park cafe for a delicious hot chocolate and mince pie or perhaps a hot turkey bap! 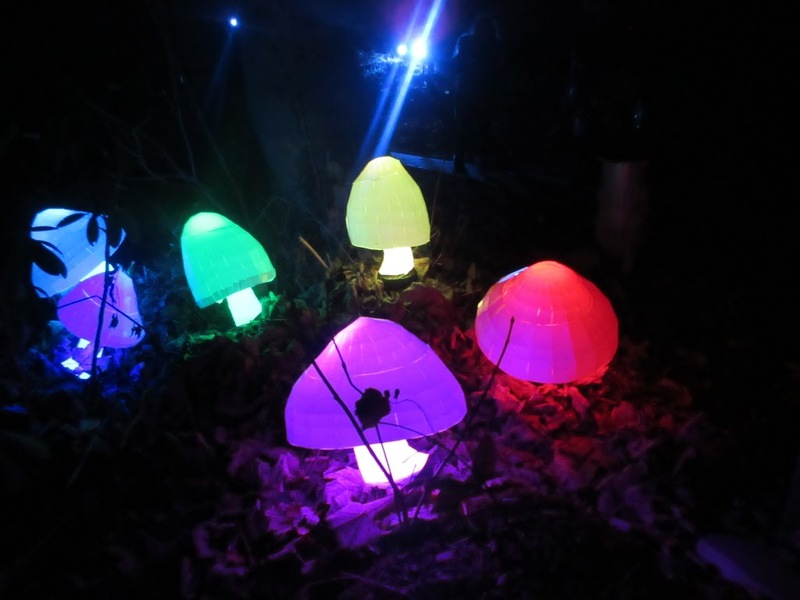 A trip to the Enchanted Parks is a very pleasant way to spend one of our dark winter nights instead of slumping in front of the box with a glass of wine and some ill advised high calorie snacks.. Check out the website here for more info about tickets. Next Post:Paddington 2 – a top comic caper!